The 1st Okinawa International Karate Tournament (hosted by the tournament executive committee, Okinawa Prefecture, and the Okinawa Traditional Karate Promotion Association) selected its first group of champions on the second day of the tournament August 6. The tournament took place at The Okinawa Prefectural Budokan in Naha and the Okinawa Karate Kaikan in Tomigusuku, and welcomed around 1,200 participants from 50 countries or regions who competed in 40 events divided into 5 categories of traditional Karate and Kobudo “kata”. 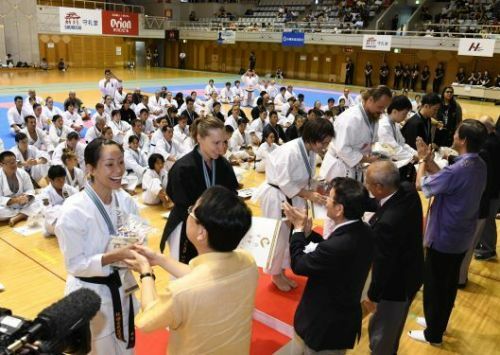 After the competition, a closing and an award ceremony were held at the Okinawa Prefectural Budokan, where bronze, silver, and gold medals were awarded to the 120 participants who placed in the top 3 of the 40 events in the 5 categories of Shuri/Tomarite, Naha-te, Uechi-ryu, Kobudo Staff, and Kobudo Sai. After the event, the karate-ka paid their respects to one another, regardless of who was victorious and who was not. On both August 6 and 7, masters and instructors will be holding seminars, teaching the kata from each of the styles. There are over 2,300 people expected to attend. After the ending of the tournament on August 7, the week-long event will close with a party at the Okinawa Kariyushi Urban Resort Naha starting at 6:30 p.m.